Every morning when Mark Mandica opens the door, he feels a pit in his stomach. He knows that today could be the day that he discovers the last Rabbs' Fringe-limbed tree frog has passed away. When that day comes, his species will be extinct forever - another in a long and growing list of animals that are disappearing at an alarming rate. He will close his eyes, and his kind will vanish from the face of the Earth forever. Many of these species will disappear without even a mention from the media. "It's kind of nerve-racking taking care of him, knowing he's the last one of his kind," says Mark, the Amphibian Conservation Coordinator at the Atlanta Botanical Garden. He admits he was not much of a conservationist when he first became fascinated with amphibians. "I was more interested studying how fast their tongues move to catch prey, not much to do with conservation. Since then it has become harder and harder to find frogs and amphibians and so now I feel obligated to help conserve these amazing and vital creatures. It's sort of an 'all hands on deck' situation." It was Mark's young son Anthony who nick-named the frog "Toughie." When asked why he picked that name, six-year-old Anthony exclaims, "Because he's the only one that made it!" Toughie is originally from the lush rainforests of Panama, where he used to spread his large webbed hands and could glide for up to 30 feet from his home in the forest canopy above. Toughie must have felt like he was flying. But Toughie's gliding days are long gone. 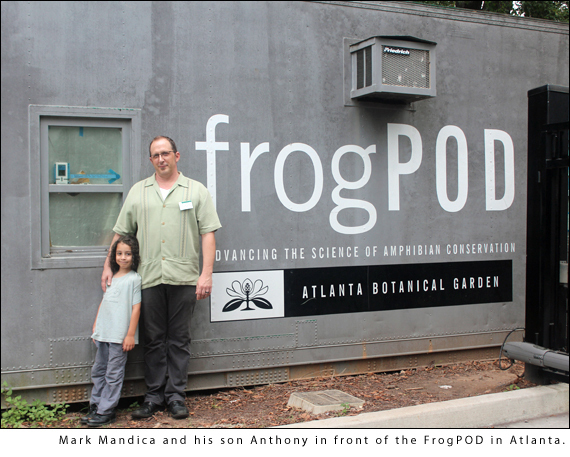 He will spend his last days here, in this unassuming grey shipping container called the FrogPOD, set in the back southwest corner of the Atlanta Botanical Garden. He is far from his home, and he is utterly and completely alone in this world. The shipping container is bio-secure, protecting eleven rare species of frogs saved from Panama on the same rescue mission in which Toughie was collected. All the species are critically endangered, but none more than Toughie. After changing our shoes to slippers kept in the lab so as not to introduce any dangerous bacteria or fungus, we enter the FrogPOD. It is warm and humid, consistently kept at a temperature near 70 degrees Fahrenheit. I make a beeline straight to Toughie's small home. As I look at this frog resting in his log, I try to imagine Toughie gliding through the air, high above the floor of the rainforest, steering his way down with outstretched arms like Superman. Now, he sits in this log perhaps wondering where his forest went, where his family is. I wonder if he can even remember. It's been almost ten years since he saw his real home. In the wild, Toughie would have raised his own young - the males are the stay-at-home parents for these frogs - but being a father in the rainforest canopies of Panama was not in the cards for Toughie. The fate of his species was written when the last female in captivity passed away in 2009. Toughie now sits silent in his log; he stopped calling shortly after being taken into captivity. He had already been silent for years before Mark first began caring for him in 2009. The call of the Rabbs' Fringe-limbed tree frog was lost forever when Toughie silenced his voice. Their call was never recorded, and the only people who ever heard it cannot describe or imitate it. The last time one was heard in the wild was 2007. It was a male whose calls were heard, but he was never seen. He may have been calling for a female that was never to come. Most of Toughie's relatives were wiped out by a fungus in Panama in 2005. Researchers went in to rescue as many of the rare frogs as they could and collected a handful of adults and a handful of tadpoles. The rest have all died of natural causes, and the tadpoles never fully developed in the lab. Toughie is the only survivor. He must be the loneliest frog on Earth. I wonder if people know that to see this small, brown frog is like seeing a unicorn - would they flock to see him? or would they react with indifference? Unlike the elephants, the polar bears, the dolphins, the whales, the tigers - there is nothing majestic about Toughie. He is just a small, brownish frog with hands that look like Gollum's. Appropriate, because he too is precious. Toughie is now at least ten years old, quite old for a frog. His status used to be recorded three times a day, but his caretakers felt it was too intrusive for the old frog, so now they record it once per day. An old frog needs his rest. He is weighed once per week by a vet to be sure his health is steady. Mark knows the day he dreads is marching closer. There is nothing he can do to stop it. No breeding program or campaign can save this little guy or his species. It's too late for Toughie. But it's not too late for others like him. Last week I was part of a team of activists from the Oceanic Preservation Society who lit up the United Nations in New York City to raise awareness for endangered species. It was a project we did for an upcoming documentary film called Racing Extinction, about the sixth mass extinction. There have been five major mass extinctions previously on our planet. This is the sixth, and it is called "The Anthropocene," which translates to "The Age of Man." As images of incredible animals from the smallest bioluminescent phytoplankton to the grandest of large cats gazed hauntingly from the side of the 500-ft building, Jane Goodall's voice echoed onto the street and crowd below. "In 200 years, people will look back on this particular period and say to themselves, 'How did those people at that time just allow all these amazing creatures to vanish?'" One of the images we projected onto the United Nations was an image of Toughie. National Geographic photographer and author Joel Sartore, who photographs endangered animals for his project Photo Ark, was there to witness it. He got misty-eyed seeing his images thirty stories high projected in front of the crowd at the United Nations. "Seeing my photos up on the side of the UN building was overwhelming. For many of the species shown that night, being in the Photo Ark is the only chance they have to be seen and heard before they go extinct," said Joel, "With half the world's species at risk of extinction by the turn of the century, the Ark has the potential to be so much more than just a roster of what we squandered." He hopes that the public will be drawn in, learn, and be moved to save endangered species while there's still time - and not just the high-profile ones. "After all, when we save other creatures, we're actually saving ourselves. It's really how we treat the least among us that will determine our own fate as well," he added. While majestic creatures draw more attention than this small brown frog, Toughie's story is one that is being repeated across this globe thousands of times over. Scientists estimate we are currently losing approximately 30,000 species per year. They are disappearing faster than we can record that they are here. This story is not just to shine a light on our loss of Toughie and his species, but to shine a light on the thousands of species blinking out every year without us even acknowledging their loss. After over 300 million years on this planet - amphibians arrived before the dinosaurs - we are losing them at an alarming rate. Nearly forty percent of all amphibians are imperiled or already extinct in the wild. "What is frightening is that we are losing them in pristine habitat, not just urban areas," said Mark. "We need to pay attention to what these amphibians are trying to tell us. I think they are telling us something bad is happening in our environment. We need to listen - if not for their sake, for ours." It's time for us to go. I say goodbye to Toughie, quietly wishing him frog dreams that bring back his distant memories of gliding over the rainforest canopy - the tiny brown Superman sans cape. We change our shoes and leave the FrogPOD. Mark closes the door behind him. He has made it through one more day, and the Rabbs' Fringe-limbed tree frog is not extinct - not today. The small, brown gliding frog will have peace and quiet for the remainder of his days in this shipping container. Mark will care for him until the last day when quietly, without any media hype, another species will silently disappear from our planet. His loss will go unnoticed by most, but not by Mark Mandica. Want to help? Don't use pesticides or herbicides and make your yard a frog friendly habitat so you can connect disconnected pockets of habitat. For more information on the Rabbs' Fringe-limbed tree frog and the Amphibian Conservation Program at the Atlanta Botanical Garden, click here.